Magento is known to be the shopping cart that combines open source technology, extreme flexibility, and expensiveness at the same time. It provides an opportunity for everyone to change the core, add new functions and change every minor part of an online store. But, in order to do these actions, it requires the highest level of technical skills. That is why lot’s of entrepreneurs are afraid of this platform and choose others to run their business. Notwithstanding, there are a bunch of free Magento Integrations that can add new and useful features to make this shopping cart meet the needs of every store owner. In this article, you will find a comprehensive list of free extensions from Magento Connect. Each of them doesn’t cost you a cent and provide distinctive functions to the platform. So, why are you still wasting time reading all this introductory text? Jump right in and find out what Magento Integration opportunity will blow your sales high in the sky. If you are doing Magento eCommerce for a while, you may notice that lot’s of marketing services are providing their integrations for free. Here is the list of them. Facebook ads extension will help to place ads on the most crowded social network with no stress. How can you imagine a modern online store without a blog? If you can’t get a WordPress integration for Magento and start putting a great content to your audience. 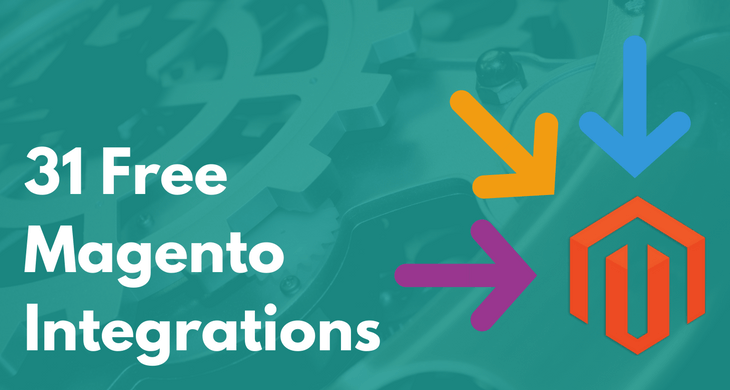 Bronto offers comprehensive marketing opportunities and the free Magento extension for the best convenience. Magento shopping cart Price Rules adds new features to the platform for more efficient promo campaigns. Add Optimizely – the world’s leading conversion optimization software to world’s leading eCommerce platform. To get an opportunity to accept PayPal and Credit Card Payments, integrate your store with Braintree Payments. 2Checkout is another payment option that generates secure gateway for your customers. European retailers can add Amazon secure payment method to their Magento Stores with a Free Integration available from Magento Connect. Aftership provides online merchants and their customers with a complex shipping software that supports main careers and allows SMS status notifications. Make the process of order fulfilment much easier and faster using a free Magento integration with Shipwire. Cronopost is a widely popular shipping career in France and with a free extension you can easily add it to your Magento store. Integrate Magento with Temando to provide promonent customer experience with dozen of shipping and fulfilment options. ShipWorks is maybe the best way to ship more in less time. It integrates the most popular shipping careers and print labels and also provides a free extension for your best convenience. ParcelPro provides insured shipping options and can be also added to your Magento store with a costless extension. LinnLive extension offers completely free and extremely simple order and inventory management. All you need is a Linnworks account and you are done. Managing online Magento and offline stores will be much easier with ERPLY integration. Create products there, transfer them to Magento and vice versa and add a POS features, etc. Hublogics say that Magento backend automation will be clean and flawless. Give them a try, because their extension will not cost you a cent. Talking about customer support every online merchant is sure about one thing. Online chat is a must and it can generate sales, not only provide the needed info for site visitors. Luckily, there is a dozen of companies that offer these feature for eCommerce stores. Below, you will find the list of integrations that are provided for free and each has their own distinctive features. After, simply choose one that suites your needs best and keep your sales growing. Tidio Chat promises 20 seconds integration. Sounds interesting. Zendesk is a known name and their extension is probably worth using. Over 5000 businesses already use Olark Live Chat. Here is a Free Extension to integrate it into your store. LiveAgent is one we use at Orange35. So, if you wish to add it to your store, contact us with your questions. Bonusbox is a leading eCommerce loyalty program and millions of members. Join this partner network and convert more sales with less efforts. As an addition to it, you can add Accumulative discounts (at $69) to enhance return customers to buy more. Every online merchant know that his customers is the most trusted marketing channel. So, integrate your store with AddThis and let your customers promote products that they are interested in. If your service is brilliant, let site visitors know about it. Add Google Trusted Stores extension to enable the trust badge on your site pages. YotPo Reviews is a great way to increse sales, drive traffic and conversion rate. All of this is in a free and powerful plugin. MageMonkey is an official and free MailChimp integration that open you an access to all benefits of this software. The next option appears to be a Mailgun Service. Mailjet is known for its simplicity and features that will make your email campaigns even more efficient. EmailDirect syncs with Magento to serve registrations and purchases and other aspects of retention marketing. So, these are some of the most popular and Free Magento Integrations that will help to enhance the features of your shopping cart. However, keep in mind that some of them may require additional costs for using the third party services or additional opportunities. That is why you have to use the best judgment to understand if they worth using. But if you will need some help integrating this or other software, feel free to contact Orange35 Support Team for a free consultation.